A deer waded into early morning's river waters. 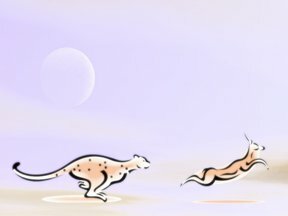 For the whole moonlit night, that sleek she-cheetah chased deer shadows. Last night, a cheetah salivated at the sight of such a handsome face. Passionately swelling, flooding, inundating cavern after mountain cave. Their bodies blossomed forth again, like just so many golden flowers. And then again they lose it. সুন্দরবনের গল্প/"A Tale of the Sundarban Jungles," published posthumously in Chaturanga (চতুরঙ্গ, "The Four Arts"), January, 1956. The Sundarban, which literally means "beautiful (sundar) forest (ban)", takes its name, so it is said, from the sundari tree, plentiful in the Sundarban jungle. The Sundarban, famous for its wildlife including the royal Bengal tiger, covers much of the lower portion of southwest Bangladesh and the extreme southeast corner of the state of Bengal in India. The tambura (also spelled tanpura) is a four-stringed, unfretted musical instrument—the strings are actually wires—used as accompaniment to much vocal music; the four strings are tuned to different notes and are played in an unvarying sequence as a constant background, a drone of sorts, to the more animated melodic line.